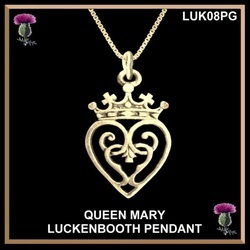 This exquisite finely detailed 10K or 14K gold Queen Mary Luckenbooth pendant is in the style of the Scottish Celtic Revival period. 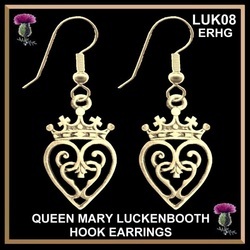 The Queen Mary Luckenbooth is made in solid fine 10K or 14K gold ... a perfect design for wearing every day. The first Luckenbooths date from the late seventh century. This traditional gift was given by a man to his sweetheart on their betrothal. It was considered a lucky charm, protecting the wearer against the evil eye!! This item is in Brand New Condition..................but looks like it could be over 100 years old. We can also custom make this design for you in karat gold. Please inquire on pricing. 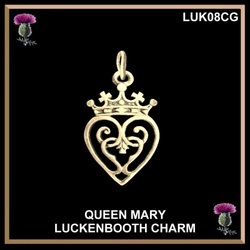 This 10K or 14K Queen Mary charm is 1" (26mm) long and is 5/8“ (16mm) wide. 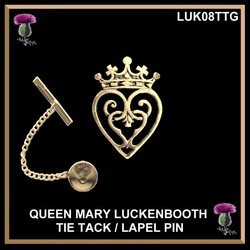 This 10K or 14K Queen Mary Luckenbooth design is 1" (26mm) long by 5/8“ (16mm). The chain is extra. 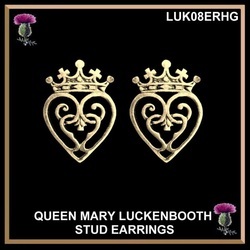 The 10K or 14K Queen Mary Luckenbooth design is 1" (26mm) long and 5/8“ (16mm) wide. The clutch is of base metal. This lovely versatile piece can be worn as a tie tack or as a brooch on the lapel of a collar or scarf. 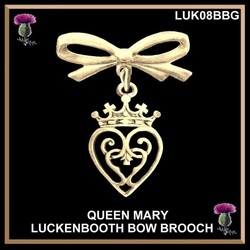 This 10K or 14K Queen Mary Luckenbooth bow brooch is 1-9/16" (40mm) long and is 1“ (26mm) wide. The pin back is a high quality bar assembly with safety catch. 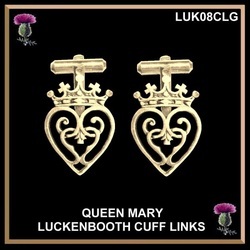 This exquisite finely detailed 10K or 14K Queen Mary Luckenbooth cuff links completes that perfect Highland attire. The Queen Mary medium design is 1" (26mm) long and is 5/8“ (16mm) wide. 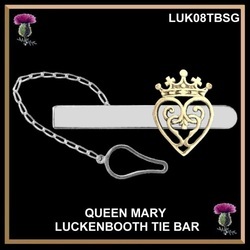 This Queen Mary Luckenbooth tie bar is made in solid fine sterling silver...... the Luckenbooth is made in 10K or 14K solid gold. A perfect treasure for any man or a great gift for the groom on his wedding day! Exquisitely made from sterling silver, the Queen Mary design measures 1" (26mm) long by 5/8“ (16mm) wide. 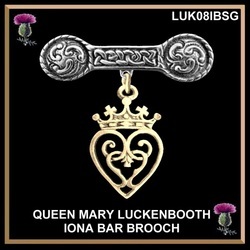 This Queen Mary Luckenbooth design is 1-9/16" (40mm) long and is 1“ (26mm) wide and is suspended from an exquisite Iona bar brooch.